"Seven courses of beef." This is a phrase which will either trigger a Pavlovian response or a gag reflex. If your reaction is the latter, you are a closeted vegetarian and should read no further, because what follows is a report on a meal which celebrates the consumption of cattle flesh. This past Wednesday evening, a few O.C. food bloggers -- which included Chubbypanda of Epicurious Wanderer, Carter, Joy and Christian of OC Mexican Restaurants -- and I, were invited by Beach to Pagolac in Westminster. 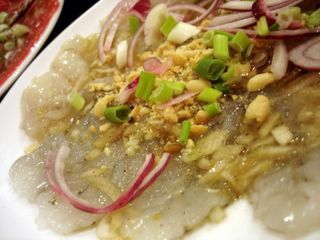 Beach is a reader of this humble blog and a gourmand who has eaten his way through Little Saigon and as well as his native Vietnam. Being a patron of Pagolac for all of its seventeen years in business, he was as enthusiastic about sharing its "seven courses of beef" specialty as we were in trying it. It was immediately evident to us that he knew this restaurant and its staff well. With a snap of his fingers, servers appeared seemingly out of thin air to replenish the rice paper, refill the water glasses, and cater to all of our requests. He commanded the kind of respect and attentive service reserved for Don Corleone himself. And he gave us an offer we couldn't refuse; an education on how to eat Bo 7 Mon. Our gracious teacher was also our host (he insisted on treating us all for this extravagant meal) and table-side chef, preparing our food with a dexterity to rival a show-boating Benihana cook. He started us off to a running start with an order of Tom Nuong Vi ($15.99) -- a plate of raw, butterflied shrimp -- which were immediately deposited onto a domed cooking apparatus that looked like a pith helmet fashioned out of steel. With a chopstick, Beach distributed the morsels around the well of the brim, where a shallow moat of drizzled cooking oil had collected. "The shrimp takes longer to cook than the beef," he explained. 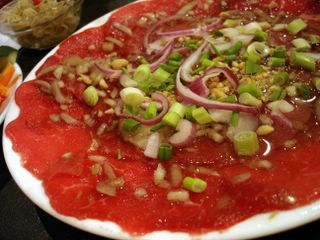 The beef was the Bo Nuong Vi ($11.99), presented in red, raw, and razor-thin slices, splayed out in glistening sheets on a stark white plate, and garnished with red onion slivers and scallions. It looked ready-to-eat as carpaccio, but it had a date with the convex cooking surface where it was to be quickly seared. In anticipation of the beef being done, Beach instructed us to peel off a few sheets of rice paper and to mound our choice of herbs and veggies onto it. I did so by picking a few leaves of tia to, mint, a wedge of green banana, pickled lemongrass, bean sprouts, and shredded pickled carrots. There was enough vegetation, herbs, and roughage on our table for a cow to chew as cud and fill its four stomachs. But in fact, it was exactly what we needed to temper the excesses of our beef exploration. Otherwise, our palates would've been quickly overwhelmed from the onslaught of fat, beef, and more beef fat. Scarcely seconds after I was satisfied at my garden-fresh arrangement, my slice of bovine flesh was ready. Beach plucked it off the griddle and placed it on top of the mound I had created. All that was left to be done was to roll the contents into a tight tube with the rice paper, which I attempted to do with clumsy fingers. I looked around and noticed that Beach had completed rolling his to a perfectly taut and symmetrical cylinder, as if by magic or divine intervention. A penny bounced off of it would've ricocheted around the room. In the meantime, Chubbypanda created a cone-shaped wrap more akin to a sushi-bar tuna hand roll. Joy and Carter's attempt looked closer to the desired egg roll shape. But all I managed to accomplish was something that looked an exploded garbage bag, with the pliable rice paper wrapper jettisoning its contents onto my plate. To correct the mess I made, I patched up the breaks with more rice paper. Soon, resigned with the fact that I wasn't going to do any better than what now looked like an obese and ragged burrito, I took it for a dunk in mam nem, a murky thick and pink dipping sauce made of pulverized and fermented shrimp. But as ugly as my parcel was, it was delicious. The salty tang of the sauce cut through the rubbery pull of the rice paper; the richness of the grilled beef; the fresh crunch of the raw vegetables; the fragrance of the shaved lemongrass; the sourness of the green banana; and the bitter-sweet earthiness of the herbs. As soon as we had finished the beef, the shrimp were ready. The same protocol followed, and wrapping it was just as frustrating to me as the last time. But similarly, the finished product was delectable. If I were Homer Simpson, a series of "D'ohs!" would have been followed by a series of "Mmmm, mam nem!" Later, our expert demonstrated the proper technique which Chubbypanda skillfully captured on video. The secret, I observed, was to squish the contents as you roll. The more you squish, the tighter the construct will be. But little did we know that what we just enjoyed was merely appetizer. The seven courses of beef ($13.99 per person) had not yet even begun. 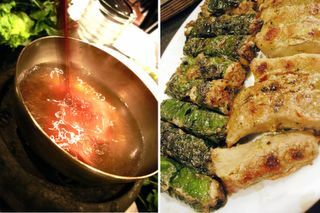 The first course was called Bo Nhung Dam and was similar to fondue or shabu-shabu. But instead of steeping the meat in plain old hot water, the thinly sliced tenderloin is swished around a simmering vinegared broth in a metal bowl. The acidic brew cooked the meat in seconds and added a noticeable zing. The tart and tender flaps were then to be wrapped up with more herbs and rice paper before consumption. The stubby meat stogies dubbed Bo La Lot packed a wallop of flavor, of beef and of spice. The la lot wrapper had peppery overtones, and felt like a cross between grape-leaf and nori on the palate. Paired with it was Bo Sate, rolled pieces of grilled tenderloin with a slender sliver of ginger hidden in its center. Supremely tender since it was essentially nothing but filet mignon, it ate like a steak, but with no cutting utensils involved. Bo Cha Dum were steamed spheres of ground beef, packed with mushrooms, peas, and bean thread noodle. Crumbly soft and pleasantly fatty, Beach placed his on top of a shrimp chip before he ate it. We followed suit and ooh-and-ahh'd when we felt the contrasting textures dancing in our mouths. The crackling crunch of the chip led the tango while the moistness of the meat followed in a perfect lockstep all the way down our gullets. On the same plate as the Bo Cha Dum, was the Bo Nuong Mo Chai, round balls of ground beef sausage seasoned with a touch of five-spice. Wrapped in caul fat, the bundles self-basted during broiling. The result was a scrumptious and smoky beef nugget which needed no additional accoutrements. These were the best meatballs, Swedish or otherwise, that I've ever tasted. The second to the last course, was a salad. Not just a salad, of course, but a beef salad named Bo Bit Tet. More slices of cooked tenderloin, this time sluiced with Italian dressing, adorned a bed of butter lettuce. The pointedly tart vinaigrette worked to balance the richness and the cool lettuce leaves refreshed the palate even further. Last but not least was the Chao Bo, a clear soup with cooked rice, minced beef, green onion, ginger, and most inexplicable of all, itty bitty pieces of star pasta -- the very same kind you'd find in a can of Campbell's Chicken and Stars. Regardless of the oddity, the soup came perfectly timed as a reprieve from an impending beef overdose. It was the equivalent of downshifting to first gear before rolling to a stop. When we were completely sated and stuffed, I surveyed the scene: complete and utter carnage. Spent beer bottles, sullied napkins, discarded herb stems, dribbled puddles of mam nem, empty tea cups and glasses covered nearly every square inch of our table -- a mess worthy of a feast hosted by the Godfather himself. I can't afford to treat ya'll to a multi-course meal like your friend. But I can certainly introduce you and other bloggers to 8 courses of fish whenever you wanna try it. 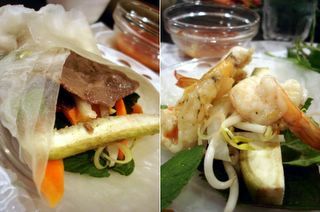 BTW, the trick to wrapping banh trang is really to not be too greedy. It's so tempting to add in every bit of greenery and noodles and meat, but then it gets too large and unwieldy to roll. Yes, definately a group meal. And you would need some big appetites in a group with me, since mine is so small, I might not make much of a dent in it. That said, it all sounds yummy. 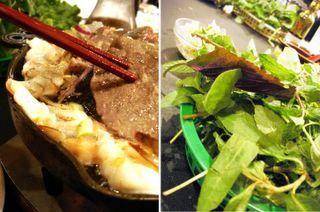 Especially the Vietnamese version of hot pot and the salad. Hey that's awesome that you OC guys met up. I know it's hard on both ends to meet up in LA or OC, but Oishii Eats and I will be down in OC very soon. 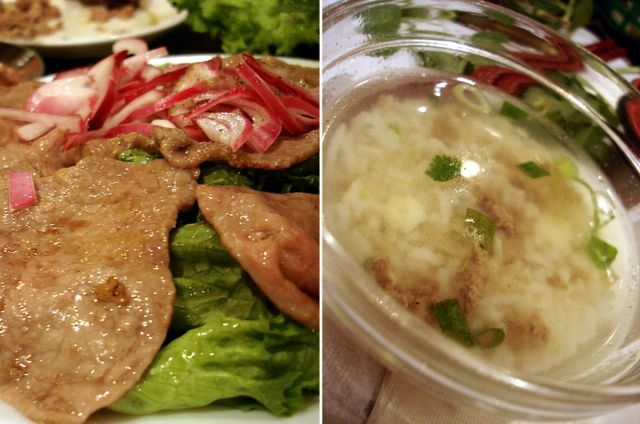 We should eat at Quan Hy - it's good! Great review, I really enjoy Bo 7 Mon. "The beef was the Tom Nuong Vi" was mistype. Beef = Bo. Tom is shrimp. Are you talking about " Nhu Y , Ca 8 mon"? That restaurant is good but their service is horrible. Had a blast. Thanks for inviting me along. You and I should do a series of these dueling chopsticks style reviews in Little Saigon. This one was a lot of fun to write. PS. Beach is the man! Oh man now I want to go have some 7 beef course...It's been awhile and beside eating 7 course of beef with only 2 person is not advised I ratehr do a big party it's just fun that way. Yup, I was talking about Nhu Y. Horrible service? Really? I've been there about half a dozen times and haven't had any problems. 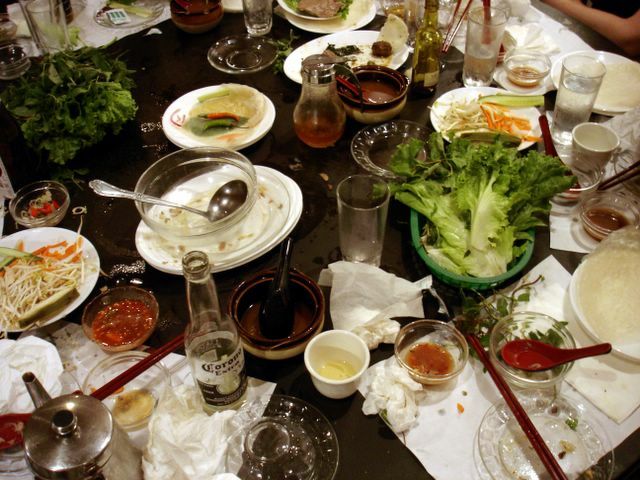 The waiters at their worst are no worse than any other waiter in Little Saigon. And if you get the nice older guy from Iowa, he was always super chatty and attentive. I have not gone to Nhu Y for at least 6 months because of their service. When I eat , I would like a little more attentive services. They always would come one time for ordering and would forget to come back to refill water and/or bring more rice paper. One thing that would always irritate me is they charge 15 % tip on top of the bill with a party of 5 or more. I am NOT a cheap tipper when I got the service but I hate to tip when I received lousy service. That is just my opinion. You may have different experience. Ooh yeah! I <3 Pagolac! Haven't been there in a while, but now you have refreshed my tastebuds. I shall suggest that next time my parents ask me where we should eat. But we seem to eat at Nhu Y a lot more for that fish course. That old guy is really nice, but i do agree that they're not that attentive on refilling drinks and bringing more veggies and banh trang. But that doesn't stop us from going there. The only thing that annoys me is that the tables are TOO small to fit all the plates! That's weird that Hong An and Anh Hong sound so much alike! I'll be correcting the link to your blog ASAP. I think we will take you up on your offer! But don't worry, there's no way we're letting you pay...We put up a good fight for the check, but Beach won out ultimately, since he instructed the staff not to take our money! HAHA! BTW, I saw the 8 courses of fish on my way to Pagolac and mentioned to the others that I wanted to try it some day. Also, you're right about not putting too much into the roll. I think that was my first mistake actually. Wanted to put a little bit of everything into my wrap. Yeah, certainly a meal to enjoy with a large group, since it's interactive and you get to see how adept everyone else is at wrapping. If you're coming down to OC, let us know. I haven't been to Quan Hy yet (Quan Hop, many times), perhaps the OC Bloggers can rally again! Oops! You're right. I just corrected it. Just wanted this opportunity to thank you again for that wonderful experience. I think you can tell, I really enjoyed it! Beach is the one to thank. I was just in for the ride. And he is the Man! I hadn't done it since the one time I tried it at a different place in college. At the time, either I just didn't appreciate it, or the place just wasn't very good. I think Pagolac will be on my permanent rotation now. Well, it's good to know the food is good. I went to Crustacean in Beverly Hills once. The service was stuck-up, the food was worse, and I paid almost $80 for Bo Lu Lac, a bowl of Garlic Noodles for two people. And oh yeah, there was an additional charge for valet. What a great write-up and an excellent chow gathering for you all. I am envious. Here is my stand on vegetarianism: If God didn't want us to eat cows, they would have defensive shielding and photon torpedoes. Never been to Crustacean. But spending hundreds of dollars for a meal isn't my thing anyway. The cheaper the food is while still being tasty, the more I enjoy myself. Wah! I'm jealous. you guys had a food blogger get together. Invite us out next time! You must be working near ES unless you are talking about Versailles in WH. Garlic Chicken is stil good even at 2 dollar more but better is their Ox tails and sweet fried banana. I think Happy is confused between Thien An and Anh Hong. I never heard of Hong An. Thien An is on Harbor near Trask. what is the name of the 7 Beef located in the 99 cent shopping center area? It's on the corner of Brookhurst and Westminster. That place is yummy I think. Glad we could all get together again: good times. And I second ChubbyPanda -- Beach is THE MAN! That's a funny image you put in my head. I'm envisioning a dairy cow equipped with advanced weaponry, reminiscent of a calendar I got from the Chik-fil-A chain two years ago. Twelve glorious months of: Cow Superheroes. Gotta try Versailles. I tried their fast food outlet at Universal City Walk, and although it was okay (never had Cuban food before that), I bet the real deal at the original location is even better. I found a Google listing for Hong An Restaurant in Garden Grove. Perhaps it came and went without anyone even noticing! I wouldn't be surprised seeing as how much competition is in that area. I think that's the one that is called Anh Hong. That was good times indeed. Isn't it great the diversity of foods we have in our backyard? And to think that we've barely scratched the surface -- this excites me. I think both of us are wrong about the 7 courses of Beef on Brookhurst and Westminster. Come to think of it, there is one in the 99 Cents Store shopping mall that I have never visited. I believe the name of it is Hong An. I stand corrected. I hate it when I have to change category names cuz that messes up everything. So... sorry about that! Since I'm not that great of a restaurant/food reviewer like you :) I just thought maybe I'd collect "weird food" items around the world and blog about that instead. :) Hehe. I'm all for all things weird. You're right, Hong An and Anh Hong do sound alike. Wanna hear something crazy? There's another place called "Thien An" somewhere off of 22/Harbor. LOL! Confused yet? Now you're making me all confused with the names, LOL! But I know for SURE there is one in the 99 Cents plaza. Thien An or Hong An, whatever. Haha. There's also a McDonald's there too. In that corner. I am 110% sure about that. As for names - you guys got me to doubt myself. Haha. 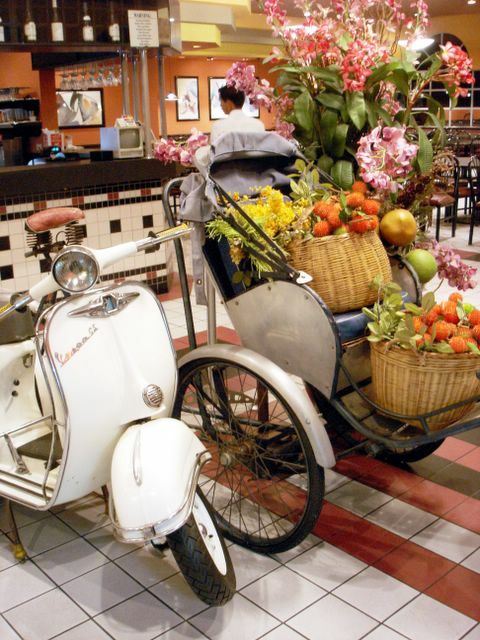 your post just took me on a trip down food memory lane--i really enjoyed this place! that's cool that the OC foodbloggers meet up; we'll have to arrange a halfway meeting point one of these days so that we LA foodbloggers don't start thinking that you OC peeps don't really exist and vice versa. actually, i just started working in the OC so maybe i can join y'all one day. Someone mentioned Quan Hy - it isn't all that, it only looks trendy, but the food is something you can totally cook at home. Their only specialty is those plain rice cakes (banh beo") sprinkled with ground shrimp, shrimp flakes, and onions, dipped with sweet fish sauce. They're expensive, though. Well, the more 7 courses of beef the better I always say. More competition means that places like Pagolac will not become complacent. I think Eddie Lin has already concluded that I am a part of the Matrix, or a character in Never Never Land. So yes, we had better set up a place somewhere in the middle sometime! 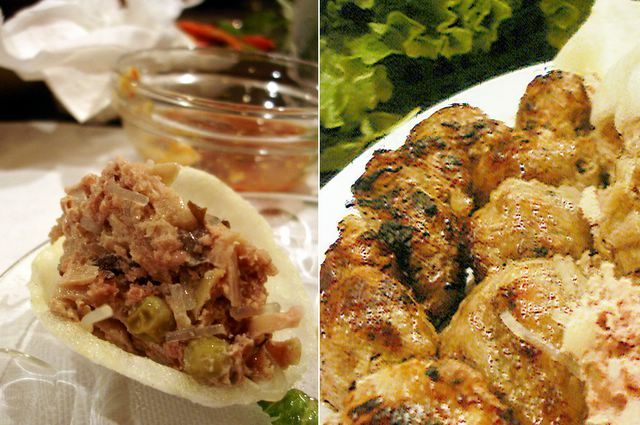 Oh I love those banh beo's. But you're right. At $5 for 8, they can be expensive appetizers. They're good though. "Tremendous": the way my gut felt after that meal! that post was 7 courses of fantastic! you crazy o.c. foodbloggers gettin' all gluttonous 'n stuff. do you guys have t-shirts and a mascot like us l.a. foodbloggers? huh, do ya? wanna rumble?! don't mind me i'm a little punchy right now. stories about 7 courses of beef always get me worked up. Cue the West Side Story CD, Track #13. Hey Elmo - Don't know how I missed this post! Looks better than any version of 7 course of beef I've ever had. It would've been cool to have you there. We spoke highly of your blog. I think someone said, "That Kirk is a machine"...oh yeah, I said that. This is the only place I'd go for 7 courses of beef! Wow both HONG AN and THIEN AN are great. great service great price great food. i think those two place are better then the other two place "An HONG" and "pagbolic" they charge too much and had the worst service i had ever seen. Although RATFORD has some good recs I might try too. That is a lot of food. What if you just want to eat with 2 people? They'll serve you with two people. You will get a portion for two. The food you saw in the pics was just all of our servings put into one plate.